Until Skyrim, I had never played an Elder Scrolls game. Apparently I have been missing out on one of the most epic fantasy RPGs franchises available. I really did not enjoy my time with Fallout 3, so I had written off Skyrim initially. Then I started hearing stories. Early responses to the game barely scratched the surface of its actual mechanics and instead dished out amazing tales of encountering demigods in hidden corners of the world, or changing upon dwarven ruins while navigating the jagged rocks of looming mountain. Listening to people talk about Skyrim can feel like listening to people sharing legends. The logic of Skyrim can turn play into a mythological experience. Allow me to describe the moment I was hooked into the world: It was my first time leaving the village of Whiteru. I had explored a nearby ruin before and explore the surrounding area superficially, but I had never strayed far from the safety of the town. In the dark of knight, I chanced upon an area full of steam vents and hot springs. I was elated and went splashing about the pools. When I looked up, I caught a glimpse of dark wings blotting out the stars and diving behind a tree. I felt as though I was being hunted, and a chill went up my spine. I thought I knew what an open world could be. I was so, so wrong. Skyrim is so consistent and realized that it is hard to stay away. I find myself avoiding the main quest lines just to explore the world more and discover more hidden treasures. Sometimes I play specifically to undertake certain quests. Other times I just wander from town to town, hoping to encounter some strange mystery along the way. Of course the game's many absurdities stand out, partially because everything else is so clean. Yes, I can put a bucket on someone's head and then rob their home without them noticing, and yes, sometimes dragon skeletons move of their own accord, rolling over themselves like an energetic puppy. I do my best to look away, to keep that fourth wall solid and impenetrable. Ignoring the game's most obvious blunders is not easy, but it is very much worth it. When I am truly lost in Skyrim, when I am fully immersed, it will take more than an glitchy dragon or a wandering head of cabbage to shake me out. Have you met M'aiq the Liar yet? He's a staple of Elder Scrolls games. He's a Khajiit you can find in the world who obliquely refers to game development choices, previous games, game mechanics, community discussion, etc. But he does it so subtly that you could just think in-game that he's a weird dude. He's the developer's way of looking out the fourth wall without busting it down a la the Kool-Aid Man. I have played Morrowind, Oblivion and now Skyrim. When I initially played Morrowind, I really liked it, but although I played hours and hours, i never took anything away. However, as most gamer's do, I Idealized it. Then Oblivion came out and it did have some shortcomings. Fast travel auto enabled for locations that Hadn't been explored was one. The game essentially held your hand not even giving you a chance to fail. "Its terrible compared to Morrowind, It's much smaller than Morrowind, The guilds aren't as good as Morrowind, etc etc." However, the truth was more elusive. It wasn't until I played Skyrim that I discovered something. While Oblivion was in reality more watered down than Morrowind, it worked better, in a technical sense (bugs and glitches) as well as game play. It was more fun. I had Idealized Morrowind, almost to the point that I didn't give skyrim a fair chance. The, "It's not as big as morrowind, its not as fun, etc etc" all came back. But in reality the game is much more fun, much more memorable, and is even closer to that epic sweeping fantasy that Morrowind tried to capture. It has it's flaws, it isn't as optimized for PC as I would have liked, and can be glitchy. BUT! The truth is that often time gamer's throw out the bad with their favorite games of the past and only keep the good. We idealize too much, and I almost missed out on what a wondrous and engrossing experience that Skyrim can be. Give it a chance. Pro tip: Play it any way you want. The Main story might not be as epic as, say, Xenosaga, or any "Insert 40+ Hour console RPG" but what you come to appreciate is the sincere and breathing world that has been created. Do with it what you will, it is yours to explore. Nope, haven't found M'aiq yet, but it sounds great. I haven't met him yet, but that sounds great. I dig that sort of self-awareness as long as it doesn't break the fourth wall too much. I've been seeing some backlash against Skyrim precisely calling out our tendency to see so much good that we overlook the bad. I admit I may be guilty of avoiding discussing some of the flaws of the game, but like you, I think overall it is still a wondrous experience that is unmatched by other "open world" games. I love Skyrim so far (get it off of your recommendation, when it went down to $40 just as you suggested in fact), and the reasons I love it are shallow. I feel like I couldn't play another Elder Scrolls game unless it took place in this environment. It's the mountains, and the snow, and the sound of wind in the air and ice crunching underfoot. It's a world that is not overtly magical, where wizards are strange and mysterious. Where nonhumans are rare and exotic and unfairly distrusted. It reminds me very much of my home in the American Southest. It's racist. It's dirty. It's ugly. Skyrim helps me keep perspective on my own life and politics, giving me a simple parallel to make my choices against. On a somewhat less shallow level, I have a few qualms with it. I used to really love Animal Crossing. Maybe that's kind of lame, but seriously, have you played it? It's brilliant. It's simple. It doesn't progress. It doesn't tempt you into playing for hours at a time to earn rare valuable prizes. It just asks you to relax and enjoy a simple life. Talk to friends. Write a letter. Animal Crossing is unique in that I actually want to talk to the characters; I want to read their dialogue, and I care about them. I miss them when they move. I appreciate their presents and even a simple easy chair has an emotional context behind it. The characters aren't a means to an end; they are the end in themselves. Compared with that standard, it bothers me how hollow Skyrim can feel at times. Now, it does some things spectacularly. Wandering the mountains feels lonesome and real, and it really encourage quiet contemplation while walking through obscure back roads, perhaps expecting to find something, or maybe just to see where they lead. The landscape is rich and organic enough that there's a real sense of memory that comes with each location; I can get lost in the plains and without even looking at my map, I can find my way by recognizing a mountain at a glance, or a city silhouette. That's really, really cool. But as much life and depth there is in the nature, the characters are just empty. They have a few canned lines of dialogue, but unless they need a favor, they won't talk to me. Unless they have a quest for me (or something valuable in their pockets), I can't have anything to do with them. Every person has a function or is a prop, nothing more. Noone cares about me and I have no reason to care about them. There's no memory, no consistency. I hope that's the next progressive step for this style game. I want to play a game like Skyrim, in that I can wander and explore, but I want there to be people. Not quest dispensers. Not reputation switches. Just people. People I can talk to, people who will invite me to lunch to just chat. People who will explore and enjoy the world as much as I do. Do you think that's possible in this sort of game? Would it be possible to have this game while still having leveling and progression mechanics, or, like Animal Crossing, would it have to completely reject vertical progression and exclusively rest on lateral exploration? Great comment. Skyrim was a bit too cold to remind me of the South, but I love the insight. I can definitely see where you're coming from. As for Animal Crossing, I never played it. But I did play a lot of Harvest Moon, which as I understand, strikes the chords. Those games make a world feel lived in without a crazy amount of complexity. It feels "homey," in fact, and I love that series more than I rationally should. Back to Skyrim, there are some things that reflect that. I love running into farmers for example and chatting with them. It reminds me that people eat in this world, and food must come from somewhere. But then again, the world holds the illusion of being bigger than it actually is. Major cities don't actually house that many people, so if you think too hard about it, even the farms seem slightly out of place, more like props than actual villages. I think that really misses out on the personal and consistent world you're talking about. I do think it's possible to make that sort of game, but there are a couple of difficulties. On the one hand, you have the problem of density. It's just hard to make a world big enough and complex enough without straining resources. Along the same lines, AI is difficult to put together. The worst thing in Skyrim, besides its unplayability on the PS3, is its AI. It's a real shame. On the other hand are the "gamey" pieces that you pointed out. Progression mechanics I'm ok with. Skill improvement through use in simple and intuitive, so I think that works remarkably well. Levels, however, are jarring. Skyrim is almost to the point where we could abandon levels, except they use the autoleveling system for enemies. They could have hidden that and made a better game. We would still have skill improvements and weapon upgrades to impart the sense of growing empowerment, without the world-breaking idea of levels. Aye, I think all the villages and city dwellers and all work great as props to support the mood. 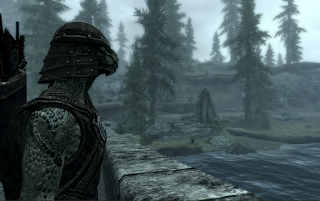 The land of Skyrim really feels huge and not at all empty (unlike some other games that make a really big, flat overworld with nothing but four or five towns in it). It is just a facade, but it's an exceptionally successful one. I have no qualms with what they achieved, because really, the world feels big and it took me several hours and a lot of high and mighty legends for me to feel like more than an everyday Joe Nobody. That said, I liked feeling like a small fish in a huge, huge pond. I liked the grand feeling of getting up and travelling, on foot, across huge majestic mountain ranges. Getting lost at night. I feel like the next progressive step these games could take is to make the player smaller longer, but let them feel welcome for it. How crazy--and scary--would it be if there really were 50,000 other people like me out there in the country and it was more than a grind to be exceptional at all? Shoot, maybe I really just want to play Mount & Blade. Now if they made that game open-world, that would be so boss. I did hear of someone making a living by chopping wood alone. I also had a friend commit to walking absolutely everywhere. Maybe it's what you make of it.